Everything will start on Monday when riders and officials will be involved in the preliminary and technical procedures. At the new race headquarter at Skydive Dubai – the well-known skydiving location in the Mina Seyahi area – almost 600 people have to follow the protocol required by a professional race as the Dubai Tour. Accreditations, licenses control, race management meetings to arrange a 112 riders race, a TV show broadcasted in 192 countries and all the facilities for around 180 accredited media and a week-long trip across six different Emirates. 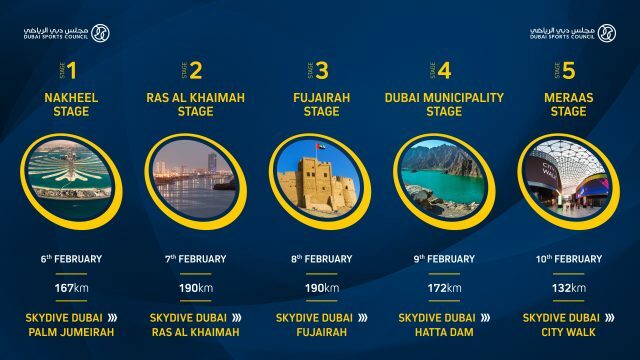 The first official step of this journey is the Top Riders press conference on Monday afternoon with the two-times Dubai Tour winner Marcel Kittel (Katusha- Alpecin), the 2015 Dubai Tour winner Mark Cavendish (Team Dimension Data), the sprinters Elia Viviani (Quick Step Floors), Alexander Kristoff (UAE Team Emirates), Nacer Bouhanni (Cofidis Solutions Crédits), the puncheur John Degenkolb (Trek Segafredo) and Vincenzo Nibali (Bahrain-Merida), one of only six cyclists all time who have won all three Grand Tours: the Vuelta a España in 2010, the Giro d’Italia in both 2013 and 2016 and the Tour de France in 2014. In the evening, at Skydive Dubai, the opening ceremony will be held, where all 112 riders from the 16 invited teams will be presented during a series of musical and dance performances. Then, on Tuesday 6th February, the Dubai Tour Fan Village (situated at Skydive Dubai) will open with a large public seating area – with bean bags, picnic tables and ‘Last Exit’ food trucks (Burger Pit, Dirty Dog, My Karak, The Brass, Dei Dei) – teams’ and sponsors’ paddocks with a wide range of activities both to watch and participate in. The Fan Village is open from Tuesday 6th February to Saturday 10th February from 9.00am to 4.00pm and the entrance is free of charge. Every day special guests will feature and join in the radio shows on Dubai Eye 103.8 and Tag 91.1 – the UAE’s first Filipino-language radio. Both stations will transmit live shows from the Dubai Tour Fan Village. On the last day, Saturday 10th February, Kris Fade, the famous Virgin Radio Dubai DJ, will interact live with the fans from the heart of City Walk.